ACRYLIC, HIGHLY FLEXIBLE WATERPROOFING MEMBRANE. Waterproof It is a highly flexible elastomeric waterproofing membrane designed for use on a wide variety of vertical and horizontal substrates where movement is to be expected. Waterproof It exceeds the highest standard required for waterproofing wet areas - AS 4858 achieving Class III, making it suitable for a wide range of waterproofing applications. Waterproof It dries grey with a smooth surface finish and remains highly flexible under extreme elongation and under constant exposure to moisture. Unlike bituminous membranes Waterproof It does not soften and attract dirt and stains and has excellent chemical resistance and durability. It may be easily cleaned with mild detergents and water. Waterproof It is UV resistant and can be used in exposed areas without embrittlement. Waterproof It is a soft coating and not suitable for high traffic areas unless covered with a suitable protective covering such as tiles but will withstand light foot traffic. 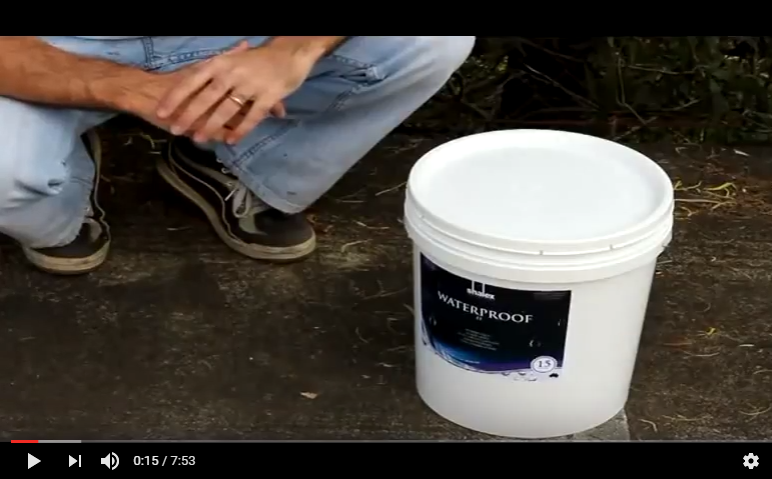 Waterproof It is suitable for application over a wide range of substrates including, concrete, masonry, fibre-cement sheeting, plaster board, brick, render, plastics, metal and timber surfaces. Waterproof It may be applied to damp surfaces although freedom from surface water and continual dampness is essential for curing to occur. Damp surfaces will increase drying/curing time. To view the Application Guide and Safety Data Sheets, please click here. If tiling over Waterproof It, ensure the screed is placed over the cured membrane. Do not use solvent based adhesives as these will soften and compromise the performance of the membrane. If exposed to weather, do not apply if rain is imminent or if the temperature is below 5°C or above 35°C. Applying the membrane during cold weather, where there is limited or no airflow over the membrane, may result in the membrane failing to dry. In enclosed areas introducing airflow by using a fan will assist in curing. Waterproof It has been designed to give an opaque finish when applied to the required thickness. If the substrate is clearly visible through the dried membrane, then additional coats will be required to achieve the required dry film thickness. Customers are advised to consider the information in this data sheet in the context of how the product will be used, including surfaces and any other products used. The information provided in this data sheet represents our best scientific and practical knowledge. Any advice, information or assistance provided by Shalex in relation to its products is given in good faith, however is provided without liability or responsibility. Due to the wide variety of site conditions we are unable to assume liability for any loss that may arise from the use of our products. The user is responsible for checking the suitability of products for their intended use. Waterproof It is a water based membrane and not classified as a dangerous good for transportation. We can ship this product to all areas via postal services and have express courier options for selected locations. Add this product to your cart and use the estimate shipping and tax feature to view shipping charges to your location.